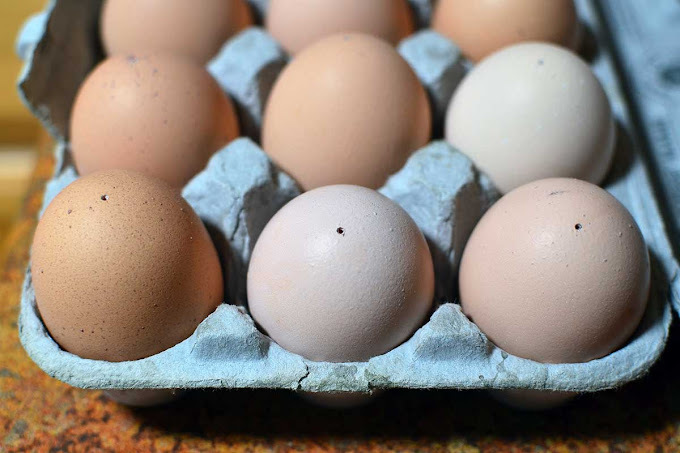 I love everything about keeping chickens, and I especially love having an endless supply of fresh eggs. and I also end up in a very bad mood. It's always a lose-lose proposition, so I gave up hard-boiling fresh eggs long ago. Which is a crying shame because egg salad sandwiches have always been my favorite. for fresh hard-boiled egg success. "Stick a pin in it," she said. to use the right tool for the job, so I bought an official "egg piercer." 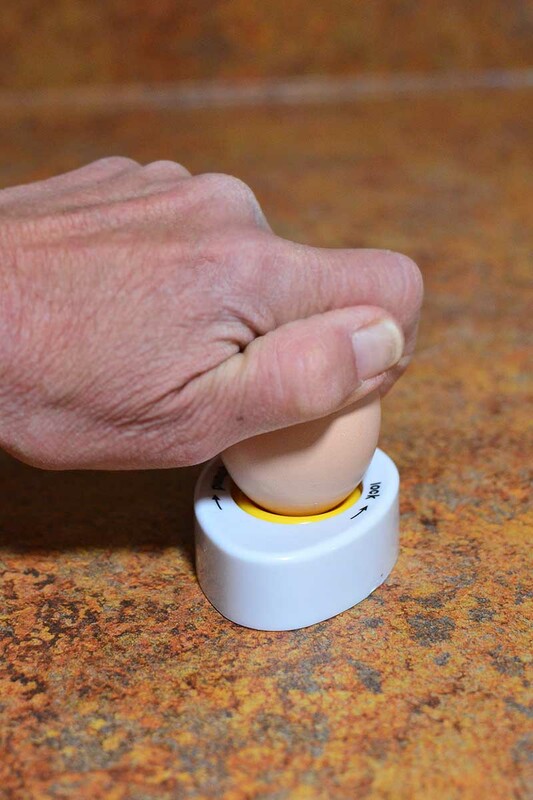 You place the fat end of the egg on top of the yellow thing and push down. It's as simple as that. The tiny sharp object at the bottom of the device pierces the egg, unlocking the membrane from the inside of the shell. Or something like that. I'm not exactly sure on the whole science part of this process, all I know is that it works. let them boil for 12 minutes, then run cold water over them for a few minutes. 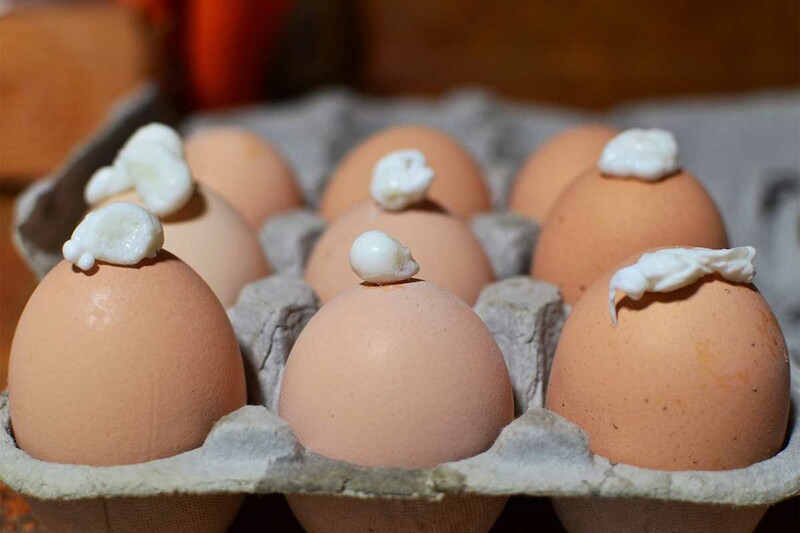 So that's what I did with my pierced eggs. Here they are after they've been boiled and rinsed with cold water. Most of them are wearing hats because some of the egg white leaked out of the holes. A very small price to pay for a shell that slips off in two pieces. Ohhhh, the frustrations I've had too! Wow Carson, thanks for the input. Egg salad and deviled eggs, here I come! So you ate 6 hardboiled eggs...?! Your eggs are so fresh and my Mom always said you know they are fresh when they are hard to peel. I also bring mine to a boil then I shut off the heat and let them sit in the hot water for about 8 minutes then run cold water over them to stop the cooking. While they are basking in the cold water bath I bang both ends of the eggs so the shell cracks. This way cold water seeps in around the the egg and raises the shell off the egg a little. It is easier to peel as well. Ah this summer egg salad sandwiches for you. How 'bout a recipe for the best egg salad sandwiches from your followers? Even though I don't have chickens and only use store bought eggs, I often have a tough time peeling them. I will try your piercing method. One trick I use to identify hard boiled from fresh is to "X" the eggs with a marker. Thx for the information eh!! I buy my eggs from the local farmers market and they are as fresh as yours. I am ordering an egg piercer today! Thanks for that info...we just complained about this today at the Farmers Market. Everyone seems to have some secret, but I've never had the success they speak about. This looks like the trick!! Sandra is right. When making boiled eggs, use the oldest ones you have, never the freshest. Also bring to a hearty boil, then cut the heat and let them sit. No more rubbery whites and usually the peels just slide right off. Visit deviledeggs.com for the perfect boiling instructions. I use the same technique as you, Sandra, and they almost always peel easily. I didn't know that the hardest to peel eggs were the freshest. I too had this same problem. A few months ago, I saw on an online TV show the "correct" way to boil fresh eggs that resulted in them being easily peeled. It works! Have the water boiling before lowering the egg into the water, then set the timer for 17 minutes. After the 17 minutes, lift out the eggs and put directly into ICE water. Thank you for this tip too! 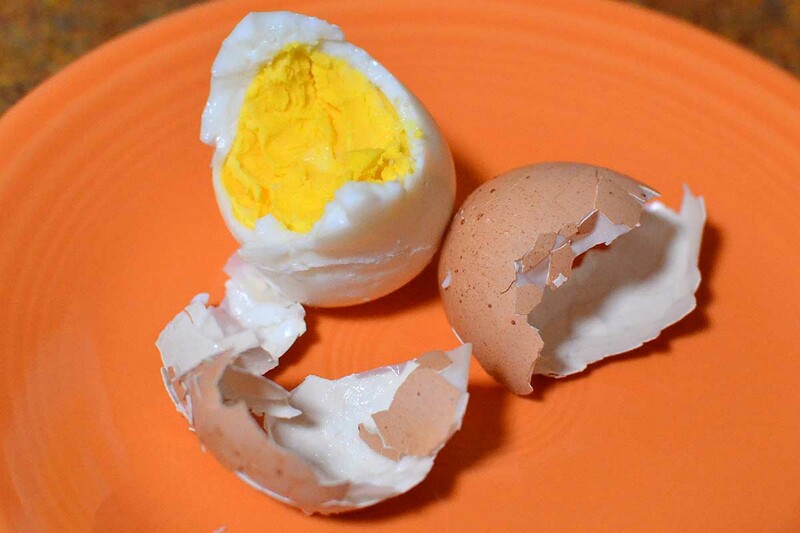 Terry Golson at Hen Blog has instructions for hard boiled eggs. I think she steams them rather than boils them, although I don't remember exactly. 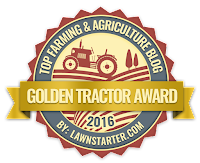 Check her blog and ask her, she's very helpful about chickens. I never would have figured that one out on my own. Or known that fresh eggs didn't hardboil well, for that matter. Isn't it great, the fantastic network of knowledgeable people blogging brings into our kitchens, front rooms, and gardens? I was the deviled egg girl at work potlucks. Two dozen, boiled, cut,mashed and mixed. There were always some that weren't pretty. They were the ones with the most love in them! I don't think I've ever eaten an egg straight from the chicken... city girl. I've never seen this little gadget either. Your boiled egg is pretty! Enjoy the eclipse. Fingers crossed for pictures. fresh eggs very seldom peel easy, I always us older eggs to boil. Fresh eggs are wonderful... except for boiling! My mom used to get frustrated by your problem (doesn't bother me... I don't care for hard boiled eggs and rarely make them!). She used to dip them in boiling water again for a few seconds before peeling. Theoretically this would cause the shell to expand and pull away from the membrane. Deviled eggs and egg salad samiches are a favorite here at Casa de Cuckoo. A friend gave me an egg piercer a bazillion years ago. The grands know the piercer is "sacred" and not to be messed with just like my sewing scissors and tweezers. There are just some things that are taboo. Ya know? What a nifty little gadget? I always put my eggs in cold water, bring to a boil, simmer for 20 minutes or so (high altitude), run cold water over the eggs and I crack the shells on each egg while the cold water is running. Sometimes they peel nicely, sometimes not so much. 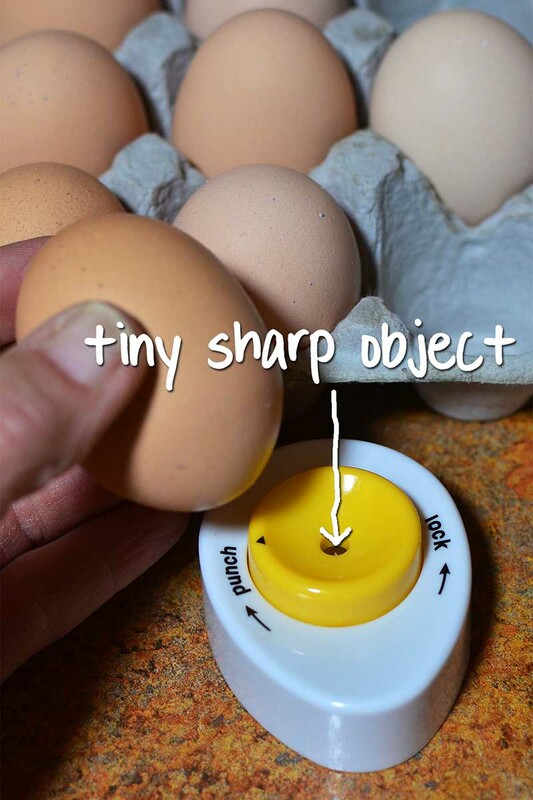 I need to order a couple of this egg piercing tool. Wow, timing! I just saw one of those egg piercers in the store and thought "What the heck is that?" Germans eat a lot more hard and soft boiled eggs than we do. In fact every German house has egg cups in the kicthen, and little knit "hats" for the eggs to keep them warm on the table in their cups. Watching Germans eat their eggs from those cups is fascinating. They have such amazing technique, carefully tapping the egg all the way around, removing the top half of the shell, and then spooning out the rest. It's at those times when I feel like I have no class at all. Try a new boiling technique? Put them in cold water, bring to boil, immediately remove from heat, cover and let sit for 10ish minutes. Remove and allow to cool on a towel. When cool enough to handle, roll them on a plate to shatter the shell. You should be able to grab the membrane and pull most of it off in a strip. A friend taught me this method years ago. It is easy and...you don't get that green cast on the cooked egg! Must go buy one of those egg piercers. A corsage pin works but your Dad's feeling about getting the right tool for the purpose makes a lot of sense. Thanks for the tip. I am going to try it for sure. I love egg salad sandwiches too and deviled eggs are a big favorite with my family. Holidays were a bad mood nightmare trying to peel our eggs to make the deviled eggs. If this works, I'll be in a much better mood! The only other thing you can do is let them sit in your fridge for a couple weeks before you boil them. Then the shell will peel right off! That's what we do with our eggs. We have 25 hens and when we get a build up of eggs, we have a mass hardboiling fest because then they are easy to peel. The thing we do if we have to boil fresh eggs is instead of peeling them after boiling, we cut them in half with a butter knife then use a spoon to scoop them out of the shell...it works suprisingly well with very little lost white. The only reason they dont peal is that they are freash. Tells you how long it takes to go from chicken to store that there isnt any problem peeling store bought eggs. Put a few days worth in a carton in the fridge and leave them for 2-3 weeks. Then use for hard boiled. Add new ones and let them age. Then no peeling problems. But the little tool is cool too! If I'd seen that gadget on an 'infomercial' I would probably have scoffed, because they probably would have wanted $29.95, payable in two easy installments... BUT WAIT!! !, order in the next 5 minutes and you'll get another one absolutely free (just add shipping and handling! ), so you can pierce two eggs at the same time.. ha-ha!! Now that we have a reliable source in you (and not a paid spokesperson), I'd feel very comfortable buying this! Oh, and is it me or is that a HUGE yolk there?? Is that what you get regularly? Wow. The hens are so worth their 'palace' that you built! Thanks! I am going to order an egg piercer today!!!! Great tip! Another must-have gadget for my kitchen. Wow, the yoke in that egg is enormous! Eureka! Who knew???? Now we all do! I use 2-3 week old eggs for hard boiling. They come out perfect for deviled eggs and still taste divine. I'm wondering if that's a special problem with fresh eggs versus the grocery store kind as I've rarely had my boiled eggs stick to the shell. But now that I have 5 week old hens and am looking forward to fresh eggs someday, I may need to do this. From what Jenny said, maybe it is a matter of letting eggs age. Hmmm... so much to learn. Thank you so much! I had all but given up boiling eggs and I miss them! I especially like to slice one while it's still hot and put it on some good bread with lots of mayo and pepper. The hot boiled egg sandwich will now be back in my late-night snack rotation, thanks to this information. The way I hard boil my fresh eggs works every time with out little hats..lol. All I do is bring a pot of water to a boil and I add about 1 tbsp. vingear. Add eggs and boil for 15-16 minutes. Drain and run under cold water. Drain and lightly roll eggs around in pot. Egg shells will break up and come off VERY easily. Fool proof for me. Hope it works for you.